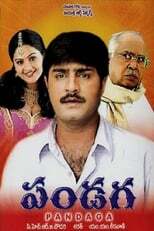 Pandaga (English: Festival) is a 1998 Telugu, drama film, produced by on Jayasri Art Pictures banner and directed by Sarath. Starring Akkineni Nageswara Rao, Srikanth, Raasi in the lead roles and music composed by M. M. Keeravani. The film recorded as Super Hit at the box office.